Obituary for William A. Hays | Readshaw Funeral Home, Inc.
William A. "Pap" Hays, age 89, surrounded by his loving family on Thursday, November 29, 2018 of Carrick. Beloved husband of Jean E. (Rostek) Hays. Father of William A. (Cheryl) Hays, David J. (Jeannette) Hays, Diane (Lloyd) Woodward and Maryann(the late James) Barringer, James E. (Nicole) Hays and the late James E. Hays, Sr. Grandfather of 20 grandchildren and numerous great grandchildren. Brother of Audrey Stepanovich, Jacqueline Hays Komidar and the late Shirley, Carol and Sandra. Long time friend of Bill W.
Family and friends received Sunday 6-8 PM and Monday 2-4 & 6-8 PM at the Readshaw Funeral Home, Inc. 1503 Brownsville Road, Carrick. Funeral Prayer Tuesday at 9:45 AM followed by a Mass of Christian Burial 10:30 AM Holy Apostle's Parish, St. Basil Church. 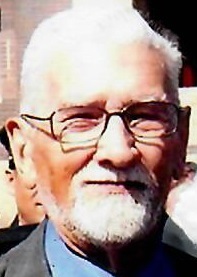 Bill was a staple of his community and active in St. Basil's Church and Volunteers Field.